The baker’s dozen quartets by Ontario native Schafer (b. 1933) may be the most important body of chamber music by a Canadian composer, yet before he wrote the first in 1970 he had shunned the genre, considering it passé. Nevertheless, his innovative work in “acoustical ecology,” the World Soundscape Project, underlay much of his music in the 1960s and ‘70s, including the featured piece, Quartet No. 2, Waves, which grew out of the study of wave patterns on Canada’s east and west coasts. As always, the unique setting of the Shalin Liu Performance Center supplied enhancing visuals, the waters of Rockport Harbor being continuously ruffled by a moderate breeze. 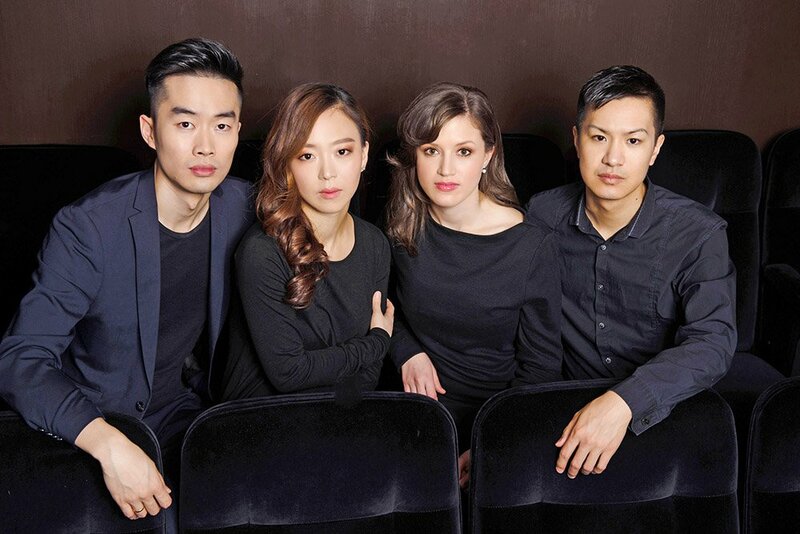 The single-movement work began with a solitary hushed tremolo from the first violin, Luri Lee, gradually joined by the others, second violin Emily Kruspe, viola Hezekiah Leung, and cello Jonathan Lo. The players sometimes coordinated in various groupings and other times played independently as individuals. Schafer’s musical suggestion of the ocean at times made it take on the aspect of a quasi-living organism, though the many mountings and abatements of energy and power were unpredictably irregular, like the sea itself. Many repeated sequences of tritones appeared (the musical representation of instability), most notably at the final climax when the four musicians played in fortissimo octaves. At a quasi-reprise of the opening material, the three upper string players one at a time rose to their feet and slowly walked offstage, playing as they went as well as from the wings. (If this made an homage to Haydn’s Farewell Symphony, it went unexplained.) Only the cellist remained onstage, and when the others finished, Lo gave us an expertly controlled very long diminuendo on a single bass note in a near-literally atmospheric ending. The latest project of bass-baritone Davóne Tines and his artistic partner Zack Winokur, “Were You There,” a production of the American Modern Opera Company (AMOC) constituted the second half. 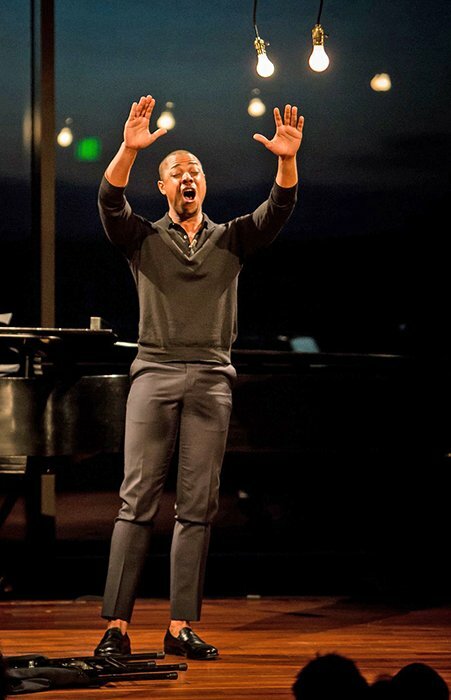 Inspired by the disturbing trend in recent years of police violence targeting people of color in the U.S., it encompassed the Handel aria “Leave Me, Loathsome Light,” the original song, “A Clear Midnight,” by Tines’s longtime musical collaborator, Matthew Aucoin, and five other well-known tunes of African American origin from the time of slavery up to the civil rights movement. Pianist and musical arranger Michael Schachter joined Tines and the Rolstons onstage below a minimalist stage lighting set-up of suspended naked light bulbs. The Handel, expressing a desire to leave behind mortal life for the peace of “silent night,” was very moving and handsomely sung: Tines’s voice has a most exceptional resonance and richness of upper harmonics. The quartet accompanied sensitively, though the continuo realization (on the piano) was not ideally idiomatic. However, it segued affectingly into the title spiritual, minimally accompanied by string drones and sung with deep emotional vulnerability, lingering on the multiple “trembles” of the refrain. Without a break Tines continued into “Sweet Little Jesus Boy,” unaccompanied and infused with protective warmth. Though Walt Whitman’s poem “A Clear Midnight”—not unlike his “Toward the Unknown Region” —certainly echoes the ideas of the Handel aria’s text, the song is much more triumphant than the aria, given Aucoin’s forceful piano part and vocal line (“This is thy hour O Soul, thy free flight into the wordless”). Tines and Schachter used a declamatory style to compelling effect. Schachter’s creative arrangement of “Nobody Knows” found strings joining piano, combining an often Gershwinesque musical language with gospel elements. Then, after a momentary silence, the singer recited the names and ages of black people killed by police, with the dates of the incidents, starting with Trayvon Martin in 2012 and continuing up to last month. Having finished the lengthy list, Tines lay down supine on the stage to sing “We Shall Overcome” softly but intensely. Just before its ppp final cadence, the bass-baritone abruptly sat up to begin a rather energetic version of “Amazing Grace.” Unafraid to bridge the gap between performers and audience, Tines soon had the audience join in, first clapping along then singing as well, in quasi-revival style. He and Schachter were similarly fearless about fusing genres, the audience’s participation being supported by interesting, sometimes unusual harmonies in the accompaniment such as one would never hear at a revival. One could quibble about the whole presentation’s sometimes stagey (but also sometimes emotionally enhancing) dimming/brightening of the lighting or the occasional non sequitur among the plethora of musical styles, but these became minor considerations in the face of the very real emotional connection the singer and instrumentalists forged with the audience. The fervent response of the listeners in the concluding standing ovation left no room for doubt on that score.